In Autumn last year(1997) the young couple renting our house in Cambridge announced they were going to buy and live on a narrowboat, all very Bohemian we chortled and thought little more of it. A few weeks later we visited them in their new home on the Cam. "You should buy a barge", they said with the missionary zeal of the newly converted. " Ah, but we have a daughter, a dog, a cat and five goldfish. No room for all of us on one of these," we both chimed in unison with all the smugness of the man who thinks he's found the one sure fire line to make the Jehovah's Witness on his doorstep turn into a supine jibbering wreck. "Then you should have a Dutch barge", they riposted. " A what?" we said. Before we new what was what, our house in Cambridge was sold and with the filthy lucre barely in our pockets, we were on the first plane to Amsterdam. Friends and family told us we were insane to consider buying a barge. Those who were polite enough not to say so, clearly thought there existed strong grounds for a sectioning order under the Mental Health Act. Judging by the look on my mother's face when first told of the grand plan, I doubt she could have been more surprised if I had announced that in fact, I was the second coming of the Messiah and would she please be so kind as to address me as Lord from now on. Disbelief and general hilarity amongst our coleagues, friends and family did nothing but stiffen our resolve. We had decided early on to buy an unconverted barge in Holland. With our research done and a mooring arranged, we had a clear idea of what we wanted. It had to be big, it had to have character and it had to be as old as possible. Britt is Danish, whilst I trace my roots to a family from Normandy who holidayed in Somerset some centuries ago and stayed, so we are Europhiles at heart. With this in mind and dreams of the arrival of that blissful day when we could disappear into the sunset, to spend our declining years exploring the backwaters of Europe, we intended to buy a Freycinet size barge. How differently it worked out. The Vriendschap was the first of many barges we saw in Holland, at just short of 50m she was way beyond the size we had envisaged. The skipper and his wife welcomed us on board with delicious mugs of strong coffee and delicate cakes, their hospitality to strangers was a matter of honour and an example of the traditions of a way of life fast disappearing in the Netherlands. With pride we were shown the entire boat. There was no doubting she was was an extraordinary and unique vessel. The Vriendschap was owned by Lammert And Tinnie Van der Veen. Together, Lammert and Tinnie had worked the Vriendschap for over 50 years, bringing up a son in the process. The Van der Veens were from the old school of skippers, owner operators fiercely proud of their traditions, their way of life and their boat. To Lammert and Tinnie The Vriendschap was not just a working boat she was a part of their lives, she was in their blood. Lammert had worked her man and boy from the days before his Father retired. The Van der Veens had survived the hard years of the Nazi occupation and the lean post war years that followed. Vriendschap had avoided the fate of so many barges confiscated in the build up to the abortive Operation Sealion because of her size and her usefulness to the Nazi war effort in carrying gravel for coastal fortifications. Throughout the war years it had been a struggle to eek out a living and put food on the table, life was made more tolerable by keeping rabbits on the board, not only to provide meat for the family, but also to barter with farmers for scarce dairy products and vegetables. For a baby-boomer such as me, used to the comforts of peace, such a life under the Nazi yolk is impossible to imagine. With the post war rebuilding of Europe business boomed, but it was a hard life with long hours in all the weathers the lord could throw at them. Only in 1994, well into their seventies, did Lammert, Tinnie and Vriendschap retire. With no one to carry on the family business it would be several years before they could bring themselves to sell Vriendschap. We left the Vriendschap not expecting to see her again. Later that day, whilst we were seeing another barge, Mr Van der Veen came up to us, smiled, winked and was off without a word spoken. Perhaps, he sensed something we were not yet aware of. That evening Britt and I sat in the bar of our hotel, warmed by Old Genever, our conversation drifted to and fro between the pros and cons of each of the barges we had seen that day. It was clear the Vriendschap was the only ship we had seen that was worthy of consideration, but we discounted her, she was just too big. For the rest of the week, we continued to look at other boats, but none were worth more than passing considering. We returned to the Vriendschap several times and despite our reservations, it slowly dawned on us that this boat was the one for us. On our return to England we made an offer through the broker which was rejected. On speaking to the skipper, we discovered there was a discrepancy in the size of the offer we had made and that which had been communicated to him. Having lost faith in the broker we resolved to deal directly with the skipper. In early march we returned to Amsterdam to tie up the deal, carrying the deposit in American Express travellers cheques, on this occassion it was not to be. 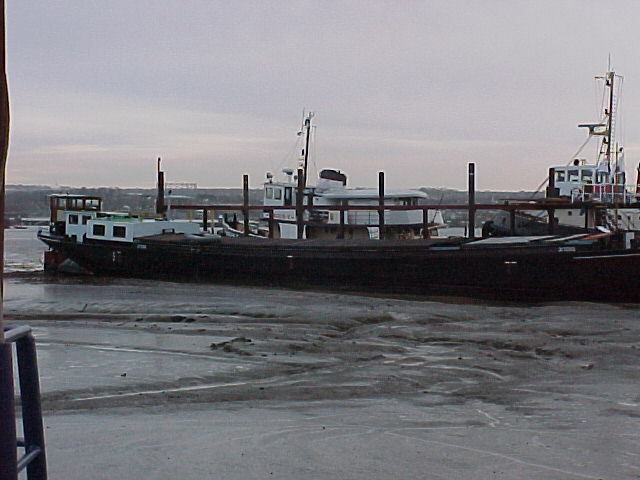 For us, buying a barge was a business deal with a large some of money at stake, we had to get it right. We approached it in the way one buys a house in England, or any other piece of business, but perhaps with the notion of Caveat Emptor too firmly etched in our memories from way back in our 1st years at law school. We had failed to fully appreciate two things; there is a wide cultural gulf between the ways the English and Dutch act in business transactions and that for Lammert and Tinnie this was no ordinary business deal. This was about passing on the mantle, money was not the main issue. Questions of whether we were suitable, what we would do with the boat, where we would keep her? These were of equal importance. The former led to mutual suspicion and misunderstandings which the latter only served to exacerbate. Requests for a survey of the hull were met with looks of horror, for them, to question the condition of the hull was to question not only the years of love and care they had put into the ship but also their integrity. For us, the reluctance to allow a survey set the alarm bells ringing. We left with the deposit still in our hands thinking we would never get the boat. That night we stayed up late into the night discussing the days events with the friends we were staying with. As a Dutchman and a Professor of English literature at the University of Leiden he was well placed to give an insight into both the Dutch and English approach, " ah, cultural differences, cultural differences", he said, " you all agree with each other, but none of you can see it." The trip was capped off the next morning in disastrous fashion when our car was written off by a truck in Rotterdam. Later that day we flew to London, dejected, with no barge and no car. In the intervening months we looked at barges at every opportunity. Over the spring bank holiday and with the bribe of a picnic I' cadjoled the family into popping down to Cliveden for the day to see the some barges and maybe make some new friends. So it was that we pointed the old jag onto the M4 and headed west, armed with several bottles of Apellation Tesco Controllee, the obligatory baguette and enough garlic dip to scare off the most fearsome vampire. We arrived at Cliveden to see the most fabulous array of barges surrounding an island midstream. Some kindly soul was dragooned into ferrying us over from the bank. Unfortunately, a little mishap occurred and I ended up impaled on a pole. Everyone was very attentive and concerned, but it's hard to be dignified lying half naked on the floor of a boat with 15 complete strangers queuing up to witness 'the accident' as I was quickly dubbed. Britt and 'the teenager' had great fun, we were welcomed with open arms (and bandages in my case! ),not only did we have a wonderful time and make lots of new friends, but best of all, 'the teenager' was hooked on barges! The fact that I couldn't walk and felt as if I'd had the world's largest watermelon surgically fixed to my upper thigh was indeed a small price to pay. In the following months we negotiated by phone and fax. By June we were in agreement. Work and travel commitments prevented us returning to Amsterdam until the middle of August when we signed the contract and made arrangements for the survey. 2 weeks later we returned to Amsterdam and Britt would stay on in Amsterdam for the four weeks we all estimated it would take to prepare the Vriendschap for the journey to England. Meanwhile, I had to return home to London to work and to look after 'the teenager'. It was with regret, that I waived goodbye to Britt. An hour later I boarded my flight for London in a more cheerful mood, having made no small effort to deplete the liqour stocks of the KLM lounge at Schipol. For the next four weeks Britt stayed with Lammert and Tinnie whose hospitality was extraordinary. By day they helped prepare the Vriendschap for the trip and by night they fed and cossetted her. In four short weeks the boat was repainted, retarred, her missing hatchcovers were replaced and no end of other tasks were completed to ready her for the big journey. Meanwhile in England, I was having trouble finding a skipper. Due to her size, most of the skippers we suggested were turned down by the insurance company as not sufficiently qualified. Finaly, Dennis Swan put us in touch with Alan Pratt, a professional seafarer acceptable to the insurers. On a bright Saturday morning in late September Paul Bailliss-Tucker, Alan and I set off for Amsterdam. Paul who, with his wife Jan, had been a constant source of support and advice in the preceeding months had agreed to come along and help crew. As we sped towards Harwich, My sense of foreboding was not helped as Alan regaled us with the story of a the time he went aground in a barge on the way back from the continent, "yes, yes", he said, " it was a foggy night and it was difficult to make out the red marker bouys. Anyway, next thing I knew we were half way up the bloody beach, turned out it hadn't been a marker bouy after all but a street lamp!" This was to be just the first of Alan's many little confidence boosting measures along the way. That night we had a farewell party on board for Lammert and Tinnie, who by now had become like family to us. It hardly seemed possible that we would at last be sailing for England. We said sad farewells to tinnie and Lammert , but our exhiliration was tinged with the sad realisation that for them, it was the end of an era. We rose early, slipping our mooring before dawn broke. As we headed into the Amsterdam Rhine Canal the sun rose sedately over the city, as if to bid farewell to the Vriendschap. With constant weather forecasts updates from home, we knew we only had a three day window to get to England before the predicted severe weather conditions arrived in the channel. None of us could afford the time, or extra costs of being holed up on the French coast waiting for the bad weather to pass. This was not to be a sedate trip meandering through the backwaters of Holland. That first day we motored remorsely, stopped only by an unmanned lock at 2am. After a hearty meal we all slept for a couple of hours before pushing on the moment the lock keeper arrived. By twelve O'clock on the second day we had reached the mighty sea locks at Flushing. As the Vriendschap headed out leaving Dutch waters for the last time, we busied ourselves on deck, stowing unwanted kit and lashing down the hatch covers. Vriendschap adapted to her new environment well, she rolled a little but it was far from unpleasant, the 100 tons of sand in her holds proved to be a good investment. Hugging the coast, we sailed towards belgium and then on towards France. By late afternoon the mist had built up and visibility became worse, not wishing to risk a night crossing in such conditions we headed into the safety of Dunkirk East for the night. As dusk gave way to night we four sat perched on the hatch covers, enjoying the simple pleasures of a relaxing beer and good company after a hard and long day. For the third day on a trot, we arose before dark and we set course for the channel under the watchful gaze of the dunkirk lighthouse. By sunrise we were heading across the channel, the mist slowly rose and a glorious autumn day was to be ours, the Gods were with us. In the back of our minds we knew we had to make it over before late afternoon and the bad weather with predicted winds of Force 8 and upwards. After six hours the white cliffs of Ramsgate began to emerge from the sea mist and by six o'clock, on a receeding tide, we gently came to journeys end at Port Werburgh. After a few bottles of champagne we all said our goodbyes. It was the end of three days of adventure but the beginning of the dream.